The Val di Peio is a 20-minute drive from our apartments. 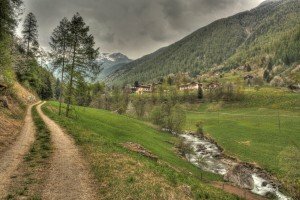 Trentino is famous for its untouched natural splendour and the Val di Peio is an outdoors-man’s paradise with a landscape that’s perfect for walking, hiking, bike riding and exploring. The valley bears traces of a Gallican-Rhaetian population that lived here a few centuries before Christ. It shares theStelvio National Park with the Val di Rabbi and has some of the Val di Sole’s oldest hamlets, all of which are famous for their organic cheese. The top attraction in the valley is the Terme di Peio, a super luxurious spa complex, which is open from December to April each year. The complex has three fonts of mineral drinking water, and a spa with thermal pools, jacuzzi and sauna. Museo della Guerra Bianca in Peio: a museum dedicated to the daily life of the soldiers on the war front and the people that lived in the valley during WWII. The Caseificio Turnario di Peio Paese is the last cooperative cheese factory in Trentino. It produces butter and cheese (Casolèt and Nostrano) every day using traditional methods and milk from cattle and goats bred in the village. It’s located in Peio Paese.